Non fatevi prendere dal panico. L'estate finisce, ma la serie di date organizzate da Doomymood Records prosegue, seppur con una nuova denominazione inesorabilmente imposta dall'equinozio d'autunno. Pertanto, la prima data del That Wasn't The Summer Of Love tour avrà luogo in quel di Latina all'Hemingway - Circolo Culturale Arci SAMCRO sabato 29 settembre. Si esibiranno Focus Indulgens, Misantropus e Pendaglio Da Forca. Ingresso gratuito. Locandina e dettagli riportati di seguito. domenica 16 settembre 2012 @ Grim Club, Cesa (AR), via Cassia Nord. Ospiti: Ashes (set acustico). Seconda data del This Ain't The Summer Of Love Tour. Don't panic. Summer is over, but the series of shows organized by Doomymood Records goes on under a new name inexorably imposed by the autumnal equinox. 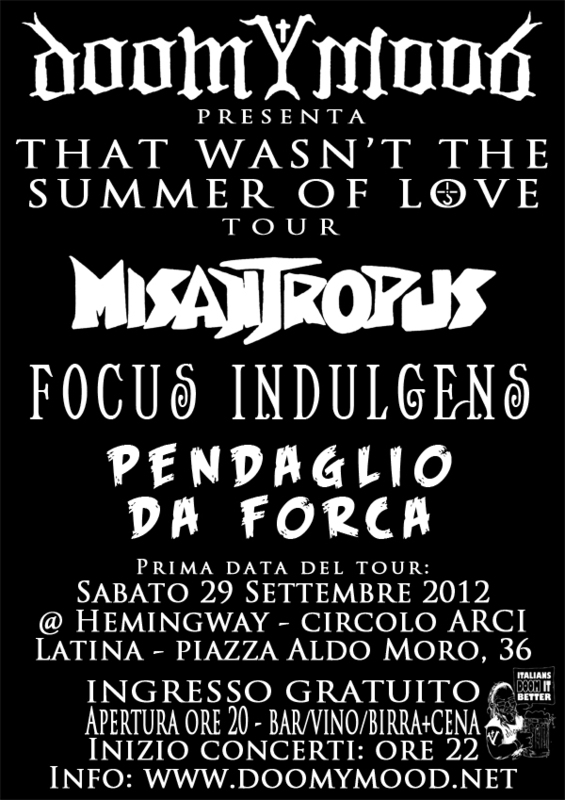 Therefore, first gig of the That Wasn't The Summer Of Love tour will take place in Latina, Italy, at Hemingway - Circolo Culturale Arci SAMCRO on Saturday, 29 September. Focus Indulgens, Misantropus and Pendaglio Da Forca will play. Free entry. Flyer below. Sunday, 16 september 2012 @ Grim Club, Cesa (AR), via Cassia Nord. Guests: Ashes (acoustic set). This Ain't The Summer Of Love Tour second show.